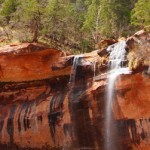 Located in Southwestern Utah, Zion National Park is truly a wonder of our National Parks system. Filled with emerald pools and shy rivers that play hide and seek amongst the soaring Navajo red sandstone cliffs, the park offers something for every interest and physical skill level. You can hike to hidden arches or take a drive into the 1930s engineering marvel that is the 1.1 mile Zion-Mt. Carmel tunnel dug deep through a massive mountains but with wall cutouts offering quick glimpses of the amazing landscape. As you can imagine, the name was tough to Anglicize, so in 1919, the park was expanded and its name changed to Zion National Park. Here are a few pictures, hope you enjoy.